Loving Mum of Moira and Cliff. Granny of Craig, Helen, Megan, Great Granny of Joel, Damian, Max and Toby. Bye Mum, rest in peace. The life of the party is resting. Love Moira and Cliff. ALEXANDER MAUREEN Granny Beach. Life is not the same without you here. My heart aches knowing that you've gone. I simply want my granny back. We love you and always will. Helen, Joel and Damian. 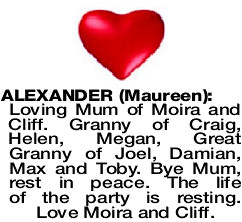 ALEXANDER MAUREEN Treasured memories of Mullaloo Beach with you as a child. Up your kilt Granny! We will miss you. Craig, Megan, Max and Toby.